BURNABY, BC – New Vega Sport Performance Protein helps you find your competitive edge by reducing recovery time so you can train again sooner and perform better. With an additional 5 grams of protein and added performance ingredients like turmeric, tart cherry, and probiotics, Vega Sport Performance Protein now offers 30 grams of multisource plant-based protein, 6 grams BCAAs, and 6 grams glutamine, to help athletes build and repair strong muscles and reduce recovery time post-workout. 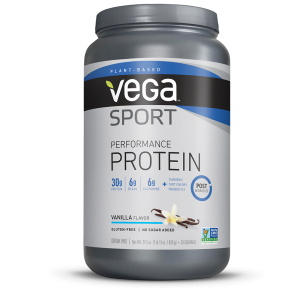 Vega Sport Performance Protein is made from pea, pumpkin seed, organic sunflower seed, and alfalfa protein for a complementary amino acid profile that tastes great. Best consumed 45 to 90 minutes after a workout, Vega Sport Performance Protein can be enjoyed shaken with water or non-dairy beverage or blended in a smoothie. Vega Sport Performance Protein is a key component of the Vega Sport Nutrition System, a three-stage system made for before, during, and after training. Vega Sport Performance Protein is now available on shelves across North America in Vanilla, Chocolate, Mocha, and Berry flavors. Find Vega Sport Performance Protein at local stores with Vega’s store locator or online at MyVega.com. Since 2001, Vega (previously Sequel Naturals) has established itself as the leader in the plant-based natural health and performance products industry. Formulated by Brendan Brazier, vegan former professional Ironman triathlete and bestselling author on plant-based nutrition, the Vega brand of nutritional products is internationally recognized. Good for your body and the planet, Vega is the clean, plant-based choice to fuel your healthy, active lifestyle—without compromise. For more information, please visit myvega.com, join Vega on Facebook at Facebook.com/vegafanpage, on Twitter @VegaTeam, and Instagram @Vega_Team.